You might have heard strong passwords are necessary to keep your account safe and secure. But now you don’t need to remember complicated passwords. In fact, you can easily login your WordPress website. Improve your website’s security by allowing two-factor verification for your WordPress site. In this blog, we will highlight on how to use password free WordPress Login by using Clef. Clef is a mobile application, used to replace passwords and usernames with your smartphones. It provides easy, yet strong two-factor authentication that shows wave when you visit a login page of a website. It enables you to scan Clef wave with the app on your smartphone. Once the Clef wave is scanned, a mobile application sends a signature in digital numbers to Clef. After In fact, you can also use Clef on your multiple websites, without entering hard to remember username and password. Clef adopts an acute encryption technology that protects your website as it produces complicated encryption keys. After installing the Clef app on your Smartphone, you need to install and activate the clef plugin on your WordPress site. Then, you can add the plugin into the menu of your WordPress site. If you are setting up a new WordPress application, then you can easily see the Clef password free login option on your admin page. When you tick mark the checkbox, Clef will start up automatically. How to Enable Clef WordPress Plugin? In order to authorize Clef on the WordPress website, you need to login your site and click on the link of Clef from the left menu. This click will direct you to the initial configuration screen of Clef, where you need to click on Get Started button to continue. You can see Clef wave displaying on the next screen. You need to set up the Clef application on your Smartphone and bring it opposite to your computer screen to sync the Clef Wave. You will see a One Step button when the Clef App on your Smartphone syncs with the Clef wave on your website. You need to click that button to finish the setup. 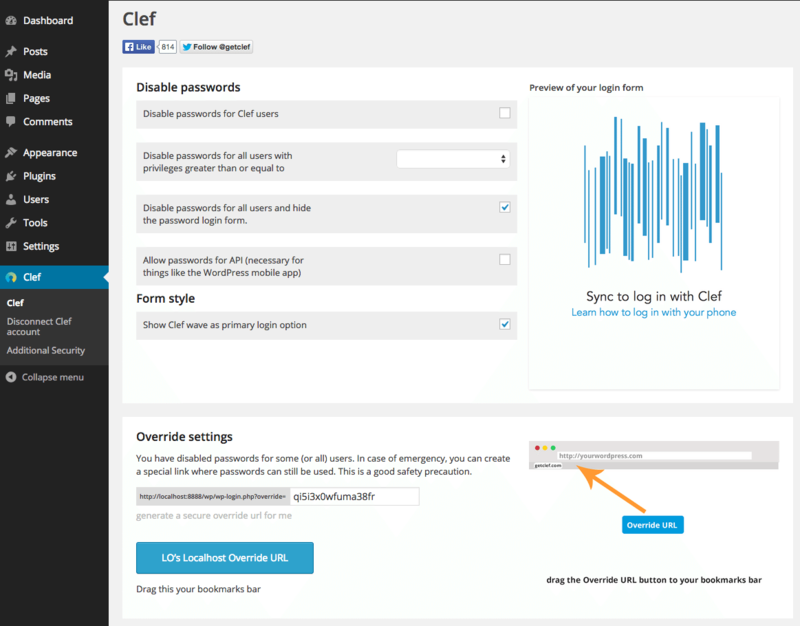 How to Password Free WordPress Login with Clef? You can also experience the password free WordPress login by using Clef. For that, you need to access WordPress login page to see a Clef button. You need to click on the Clef button to broach Clef wave screen. Then, start the Clef app on your mobile phone and keep it in front of the moving lines. This way you can simply and safely logged into your WordPress website. To log out from a website, you just need to click on logout now button of the Clef app on your Smartphone. It is very important for you to click on the button; otherwise, you will remain logged in. WordPress login with the Clef doesn’t disable the standard authentication method after its activation. It means that any person knows your password can easily access to your account. If you want to keep your account safe and secure, then you need adopt the Clef for the site users. 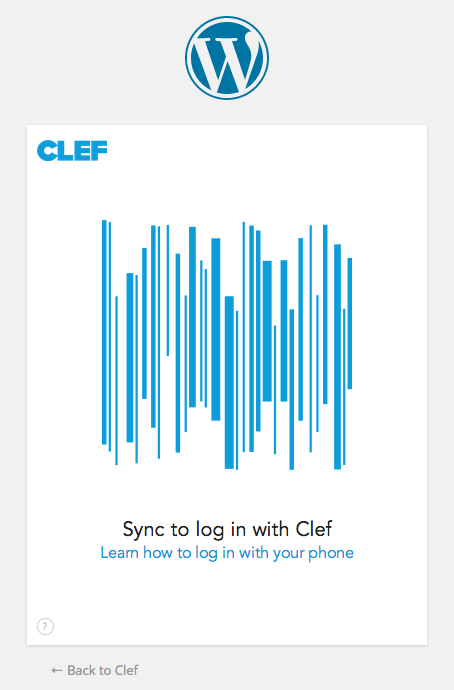 The first option on the settings page of Clef enables you to force Clef login for all users that have started up and synchronized their Clef app on a mobile phone with your WordPress site. In order to do this, you can place a mark on the disable passwords for Clef user’s checkbox. 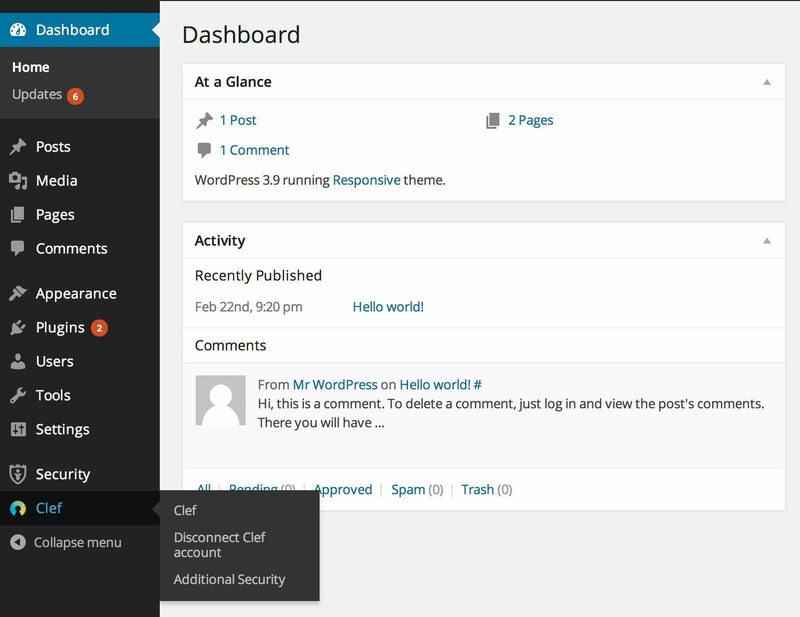 You can simply disable Clef and use the standard logging process offered by WordPress by clicking on the Disconnect Clef account link, appearing in the left menu of your admin page. In case, you lose your mobile phone, then you don’t need to worry because Clef offers you the simple and easy way to hold back the access to your WordPress site.